In Late 1998, a Band was formed that would quickly become recognized as one of today's bloodiest acts in the underworld of punk rock. Mister Monster was started by Singer/Guitarist J~Sin Trioxin. The band formed, wrote, recorded, released, and played their first show within a matter of 6 weeks of being a band. Audiences at their 1998 Halloween show were blown away with their performance, and their first release "Songs From the Crypt" sold out of its first pressing in a matter of days. 4 pressings later, the band were playing New Jersey and New York City Regularly to packed houses. Small tours of the Tri-State area, and Line up Changes would follow the band over the next year and a half. In late 1999, J~Sin recorded tracks for a 5 Song Demo. In Late 2001, the band independently financed and released the full length disk "Over Your Dead Body." This album contains cult-classics entitled, "This Night I Call (Bad Luck), and "Prom Night". The Video for "Bad Luck" along with the Video for "Gore Whore" can be found as bonus materials on the DVD for the Horror Film "Creepy Tales: Girls Night Out" (Cinema Sky) where the bands songs appear on the soundtrack along with The Misfits. 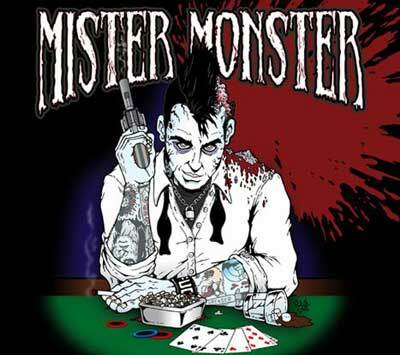 Mister Monster has also appeared on compilations such as "Grave Rockers" and "This Is Horrorpunk" along side the Nekromantix, The Crypt Keeper 5, The Independents, Blitzkid, Thye Spook, and Rock City Morgue. The band is also featured in the Activision Videogame "Vampire The Masquerade: Bloodlines" alongside Empire Hideous and Ghoultown. From their tours all over the US and self-funded releases, Mister Monster has gained cult status with fans all over the world. Their Fanclub, the Skeleton Crew, is an outfit that has helped Mister Monster get the popularity and status they deserve. Their D.I.Y. ways of touring and self-released Albums have gained them success over the 8 years they've been a band. With every ounce of blood they give, Mister Monster strives for respect among the living, and the dead. Front man J-Sin Trioxin has traveled the globe spreading his unique blend of horror and 50's doo-wop bringing classic chills back to the horror rock genre. Born and raised in New Jersey, Trioxin immersed himself at an early age into the underground punk scene. Actively involved while still in Highschool in '96, he jump started his musical career performing and touring with bands by 16. His talents as a musician lead him to join the US leg of the Misfits "Famous Monsters" tour as Doyle's Guitar Tech, and being recruited by Myke Hideous in the re-incarnation of The Empire Hideous touring the US. By 1998, he formed the Boo-Wop band Mister Monster. J-Sin and his east coast based band busted out of the grave, taking the throne as the kings of the horror punk scene. In 2001, Mister Monster released their full length debut "Over Your Dead Body" reaching instant success. With a continual ever growing demand for this release, Hells Hundred Records (NYC) currently re-issued this CD enhanced with bonus tracks and music videos. No longer content to contain himself to one act or venture, J-Sin handed his talents to countless other acts within his short career. In addition to fronting Mister Monster, he has also engaged as the role of 2nd guitarist for the popular Deathrock band, Blitzkid. As well as Producing their most recent release. J~Sin has taken on the role of touring guitarist for Michale Graves supporting the "Punk Rock Is Dead" and "Almost Home" Tours. Today, J-sin has returned to New Jersey working closely with Graves as his touring guitarist and is currently writing brand new material alongside Fang Alphamayle and Paulie Lifeless for the next Mister Monster album, "Generic For Vicodin." Influences Elvis, Stray Cats, Social Distortion, Johnny Cash, Misfits, Ramones, The Damned.